Hey y’all, I am excited to share a super chic DIY centerpiece with you today! This centerpiece was created by Chrissy, of The Perfect Palette, and if you haven’t checked out her blog, I seriously suggest you do! Especially if you are in the planning or pre-planning stage of your wedding. Her blog shares all kinds of color palette possibilities for weddings and parties and it’s always one of my go-to blogs for keeping up with what’s hot in the wedding color world! But anyways, back to today’s post… Chrissy has used FiftyFlowers several times in the past for styled shoots (like for this “Bubbly” Yellow and Gray Engagement Party Styled Shoot and this Kate Spade Valentine’s Day Styled Shot) so when she came to us recently with a plan to create terrarium style centerpieces for a Laura Hooper Calligraphy Workshop, we were all in! 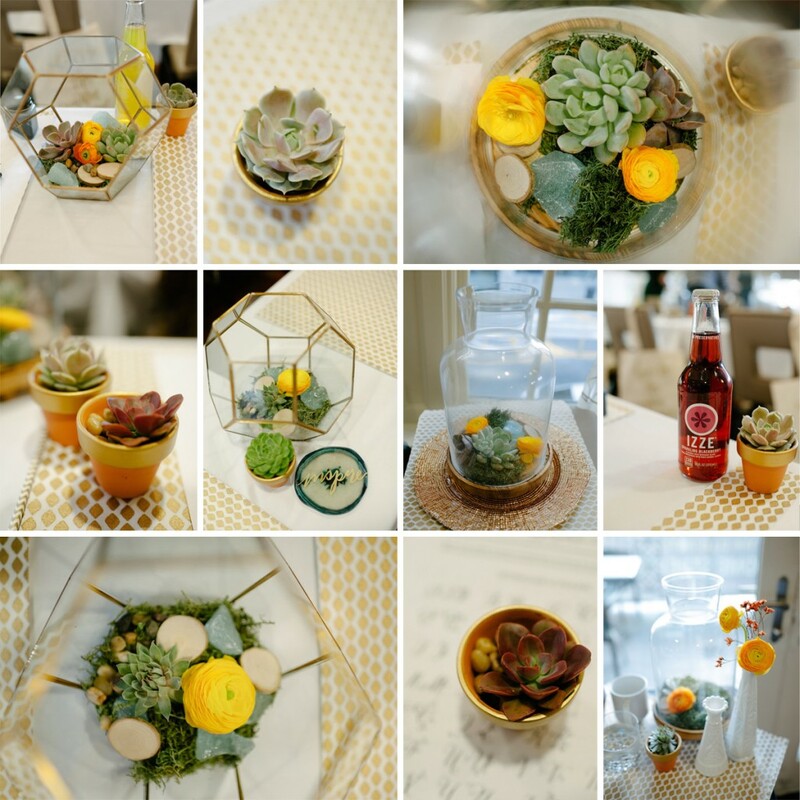 Terrarium styled centerpieces are great for Modern or Eco Chic Weddings and Events, plus, they are super easy to DIY! Chrissy ordered Assorted Succulents and Yellow and Orange Ranunculus from FiftyFlowers.com and picked up the glass terrariums from Hobby Lobby. In each terrarium she placed wood slices, rocks, moss, and a mix of succulents and ranunculus. Pretty easy, right? !, but as Chrissy said, “the end result made for a unique, and interesting centerpiece.” Chrissy also potted some of the succulents to accompany the terrariums. All you need for these are little clay pots (which you could decorate or paint for added interest, notice the gold rim on her pots! ), potting soil and in this case, some small decorative rocks (I think they add a nice finishing touch.). These would be great for favors or as name place holders. Take a look at how it all turned out thanks to Lauren Rae Photography. Do you Love?! I do! To see more from the Laura Hooper Calligraphy Workshop, and trust me, there are some cool details… like a popcorn bar… and cool calligraphy, obviously… click here! Ready to create your own terrariums? Head to FiftyFlowers to get all your floral needs! Tip: Succulents are a given for this look and I personally love the contrast between the hardier succulents and the delicate layers of the ranunculus, but you could also use spray roses, roses, or for a super modern look, billy balls! Featured FiftyFlowers Review: Stunning Wedding Flowers!